At Scoil Mhuire the music department aims to develop a passion for music in students. The music room is well equipped with a piano, drums, electronic keyboard, a range of classroom instruments, an interactive whiteboard as well as a range of CDs, videos and DVDs. The school operates an instrument lending scheme for students who are unaware of what instrument they may like and wish to try an instrument for a term. In addition we prepare a School Choir and a Traditional group. These groups perform for many events during the school year such as the school Mass, open day and the annual awards ceremony. Students successfully compete in local and national music competitions. Lessons are also provided in various musical instruments with visiting tutors providing tuition in Scoil Mhuire. Students are also provided with the opportunity to attend musical productions, with trips to Cork and Dublin frequently organised. 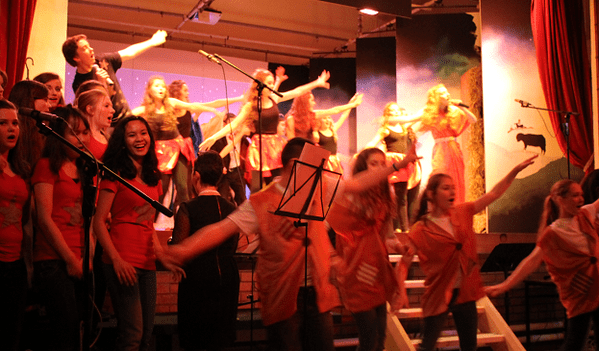 Scoil Mhuire has a proud tradition of staging excellent music and drama productions. In 2014, following a break of a few years, this tradition was revived with the superb production of ‘Rock Star’.